John Tagi is currently in his 4th year studying a Bachelor of Architectural Studies at Unitec. He received a Study Award in 2015, and recently was lucky enough to get the opportunity to become an Architectural Intern at Ignite after realising he wasn’t taking advantage of all the opportunities that Keystone offers. 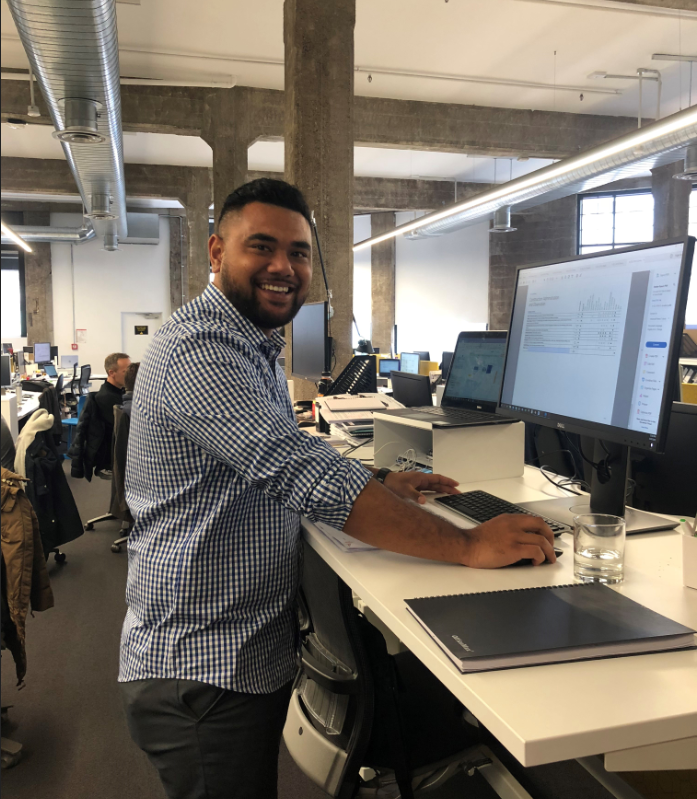 Jenny from Keystone Trust sat down with him to talk about his new role, the family trip that made him want to be an architect and how Keystone helped him to realise his potential. Jenny: Tell me about how you got this new role, I know that Keystone helped you out. How did that work? John: Yeah, it was at the 2018 Rugby Lunch that I just realised a lot of new people had come up, new faces. I was talking to my principal of my old school, because she was invited. She started talking about how ‘this scholarship so good’ and I agreed, it’s good you know. Then she asked what companies I had been with and I was like ‘uhm it’s a good question?’ I felt so bad like, what am I doing? How am I in this Trust? I need to take advantage of all these opportunities. Then I started talking to these other Keystone students who I hadn’t talked to before, and they were like ‘that’s my boss over there, that’s my boss over there’. I though, oh wow, am I the only one that doesn’t have a job in the industry? How am I not in a job right now? I should be one of those people! Jenny: What did you do after realising that? John: I messaged Victoria, and in a matter of a few days she connected me with Ignite. Anything you need, the response from Keystone is instant, it’s straight away. I literally just texted her and told her that I was ready to get a job. That’s not something that anyone else has. When you need to get some help, no matter what, they’re there and they are onto it straight away. I can’t believe I didn’t take advantage of this ages ago! Jenny: So, what are you doing at Ignite? What’s your role? John: I’m doing a lot of learning at the moment. They put me on an actual project where I did some work and it went through to the project that was finished. So that was cool, and I’ve actually done something. Jenny: Oh wow, how did that feel? John: That was on the third day and I was like, this is awesome, I’m so excited for this! This is the first job I’ve got as an intern or anything. Jenny: Did that make you realise, did it confirm for you that you wanted to be an architect? John: Yeah, it was like oh I’m doing something, I felt like I was part of it. This is my first job which relates to the degree I’m studying for. I’ve been working at a taxi place for a while, it was good money, but it was like ‘is this what I’m going to do for the rest of my life?’ But now I’m getting better sleep, my time management is better, I think I’ve gained a lot of experience and skills even just this past three weeks. Even when I’m not working on a project it’s about upskilling. Jenny: Oh yeah, they just trust that you’re doing you work. So what kind of projects do you do at Ignite? John: I’m in the residential team. So, like that’s residential buildings, retirement villages and big complexes. We deal with lots – big projects, skyscrapers, high rise, low density buildings. There’s different sectors but I’m currently learning residential, sticking with the small stuff, which is what I really want to do. Jenny: Has working at Ignite changed how you think of architecture? John: Yeah, I think its opened my eyes over here. Because in university you’re taught the basic stuff, but there’s more to it than you know. At university you’ve got these different classes, the tech class and there’s design studio and other stuff. But when you actually go into a company you understand that there’s different things that you can do. One person can be doing renders and then others can be doing packages. Because Ignite has a lot of clients, you can maintain your position or if you want to do something else, you can. That was the thing with when I first started, it was like, what do you want to do? They tested me to see what I was good at and to see what they could put me in. Because I’m an intern I’m not actually qualified to design a full plan, but Tony’s been trying to include me in those. They’re really trying to help me out, and I’m learning a lot and it’s really good. I think also that I’ve made a lot of connections here because I’m working here. When I started there were so many people that were familiar because they were at Keystone function. Jenny: When you were younger did you want to do architecture? When did you decide that that was your area of interest? John: Well my dad is a stonemason, one day we all went on a family trip to Rotorua, to be honest it was more like a family trip so that he could build a wall. He took us to the site after he had finished it and I looked at the house which was half built out of stone and I thought, wow that’s so cool. I think the features of the stone added to it, but I was like wow this is a cool house, you know. So then when I was in high school, I started looking at papers which would go along with architecture. I joined design class and then also the arts class. Jenny: Is that why you applied for the Keystone Scholarship? John: Yeah, my graphics teacher at school told me to apply for it. I think I’m the first student from my school to get it. And I didn’t really think I would get it, he said ‘it’s all over New Zealand’, so I was shocked when I got the call. Yeah, I was shocked. I mean, Keystone has done so much for me, and having Keystone networking opportunities is good too because it gives me the chance to talk to people in the industry. It’s awesome. Stay informed and up to date with the latest news and events from Keystone Trust.